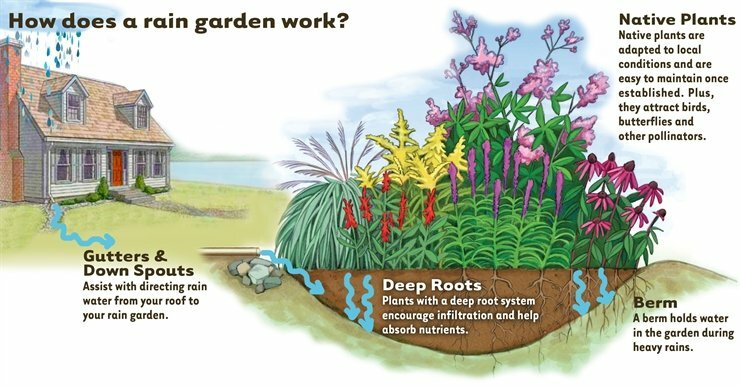 Rain Garden Guide | Seekamp Environmental Consulting, Inc.
A rain garden is a shallow depression that allows rain and snowmelt to seep naturally into the ground by capturing runoff from rooftops and driveways. Most importantly, rain gardens help preserve nearby streams and ponds by reducing the amount of polluted runoff and filtering pollutants. Stormwater runoff from residential areas often contains excess lawn and garden fertilizers, pesticides and herbicides, oil, yard wastes, sediment and animal wastes which cause water pollution. 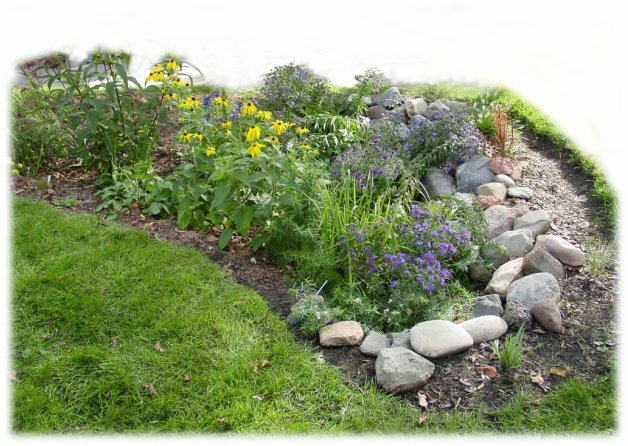 Rain gardens fill with stormwater and allow the water to slowly filter into the ground. They also help prevent stream bank erosion and lower the risk of local flooding. Do not fertilize your rain garden. Water runoff carries many nutrients and fertilizes the rain garden regularly. Place the shoveled snow next to the garden so it will be absorbed into the rain garden when it melts instead of shoveling it into the garden. Locate the rain garden away from direct road salt discharge and of course, do not add soil within the rain garden. After planting, you will want to pull weeds out of your rain garden until the mature plants crowd them out. For the first year, your rain garden will require monthly weeding during the growing season. It is only necessary to weed one time per year in the following years. Shrubs will need to be pruned annually. It may be necessary to water several times per week during extreme dry spells.